Do you ever feel like your life is a zoo? Are your circumstances spinning out of control? Do you feel attacked on every side? From this time forth, and even forevermore” (NKJV). 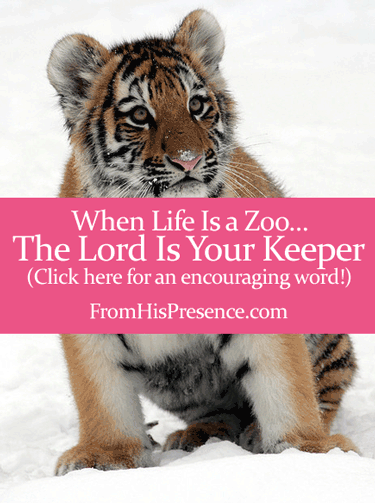 The part I want to bring to your attention is the verse that says “The Lord is your keeper….” What does that mean exactly? It’s like a tiger at a zoo. Picture this: you’re a tiger. You’ve been taken out of the wild and placed in a zoo. This zoo is foreign to you, and you can’t take care of yourself there. It’s not your natural environment. So you have a keeper. This keeper takes care of you in every way. He gives you meat to eat and water to drink. He gives you medicine when you’re sick. He cleans up after you, and he even gives you toys to play with. Why? Because you can’t care for yourself. You’re not in your natural environment, and so your keeper takes total care of you. Beloved friend, like the tiger, you are not in your natural environment either. You belong in Heaven. You came from the bosom of the Father, and one day you will return there. This world is not your home; you are a stranger here, what the Bible calls a sojourner. You’re camping out here because the Father sent you to accomplish a purpose. But this world is not your home, and for that reason, you need a Keeper. Your Heavenly Father is your Keeper. You cannot care for yourself. You cannot feed yourself, shelter yourself, clothe yourself, comfort yourself, or care for yourself in any way. But the Father will keep you. He is your Keeper, and He will never leave you or forsake you. Your Keeper is providing for all of your needs. He is feeding you, clothing you, and sheltering you. His arms are wrapped around you right now. He’s healing you and comforting you. You are not alone. Not a moment will go by in which He is not acutely aware of everything about you, and He will bring you everything you need at exactly the right moment. And my God shall supply all your need according to His riches in glory by Christ Jesus” (Philippians 4:19). No matter what you’re going through today, the Lord is your Keeper. This world is not your natural environment, and you were not created to take care of yourself here. But He created both you and this world, and He’s going to keep you and take care of you always. My friend, no matter what you’re going through today, would you meditate on this verse–that the Lord is your Keeper, that He is your shade upon your right hand, and that the sun shall not strike you by day nor the moon by night? I don’t know what you’re having to endure, but the Lord does, and He will keep you through it. What do you need the Lord to keep you from today? He has promised He will! If this post has touched you, would you leave a comment below and share how it has encouraged you! Image courtesy of Dave Pape on Flickr. Thanks so much for your post. Struggling with work issues and this was a great reminder and encouragement that the Lord has me. He is my help and provider for all things. A good reminder for me to cast all my cares upon him and stop trying to carry the load. Amen! I pray your work issues will resolve quickly and that will Jesus will help you come to Him so He can give you rest! Thank you for reading! I never quite thought of it like that. Hope it encouraged you, Rebecca! Thanks for reading! This is the first I’ve read this. What I know and what I’m feeling and experiencing are polar opposites. I have nothing left in me. I have no idea what God wants me to do and I am ready to lay down and let whatever comes come. I feel defeated. I was very inspired by what you wrote. I love the way you write, how you put things. It really makes you think, and the music was awesome. Always a blessing. Thank you Jamie. This is so very comforting. Amen!! That is what i needed to hear from my Father today!! Praise God and may HE continue to speak through you in Jesus name!